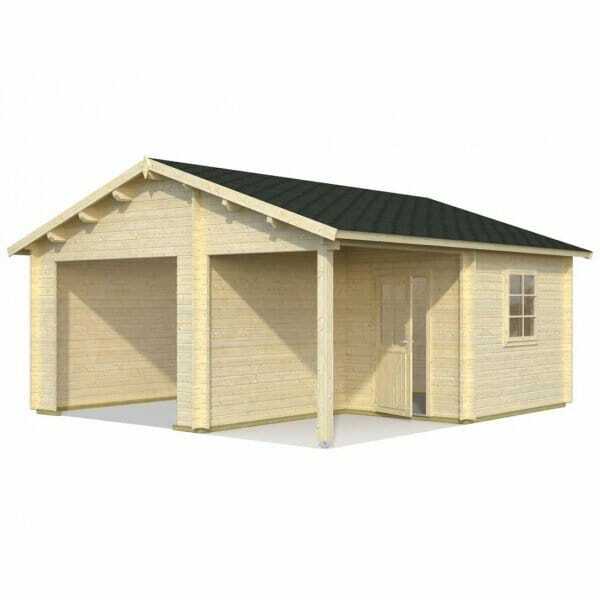 Palmako Roger 21.9m² + 5.2m² Garage: The Palmako Roger Garage can be built either as shown in the main image (i.e. with the Garage Door to the left side when viewed from the front) or as per the line drawing below (with door to the right side). There is also the following Garage Door Options: No Garage Door: The aperture is already cut into the garage wall to accommodate customers own doors 1 x Double Door Side Hung Classic Side Hung Doors opening from Centre Outwards1 x Up-and-Over Style Garage Door Kit form With Spruce Boarding Finish The Palmako Log Cabins Garage 4 is an extremely good quality and very good value Timber Garage or garden workshop. The shape of the building allows many uses for example in can be used as a garage but still have a workshop area and also features a very useful covered outdoor storage area.